No need to be at home! 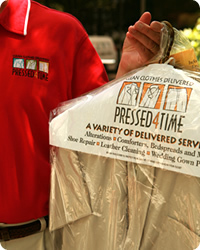 Pressed4Time is the Richmond Metro area's premier garment care program, providing convenient pick up & delivery to residential homes, offices, corporations and government organizations. Quality oriented and affordable, Pressed4Time provides the best program in the market and has since 1996! Our customers enjoy an incredible selection of programs including dry cleaning, laundry, professional shoe shine/repair, alterations, leather care, linen services, and wedding gown preservation. We guarantee our quality and service on every order, every item, every day! And there are no charges for pick up or delivery! It's FREE. To start service, simply Enroll Online or call us at 804-288-1776 and we will get started immediately. We'll contact you to review service days, service areas and to answer any questions you may have. If you represent an organization, just give us a call (804-288-1776.) Pressed4Time provides commercial programs for offices, corporations and schools!